Does your hospital have a system to ensure nurses have working equipment or they know how to get them fixed? I recently visited a hospital where the answer would be “NO”. Last week, a family member needed a day surgery procedure done at a local hospital. There were signs in the prep/recovery room touting their move to electronic medical records and no longer needing paper charts. The problem for the nurse was, the Computer On Wheels (C.O.W.) did not work. The nurse was unable to access or update the electronic chart! A second nurse came in during the morning before the procedure to try to troubleshoot the malfunctioning C.O.W. It was decided to grab a C.O.W. from another room and use it instead. I am not sure if other nurses had to search for the missing C.O.W. now that it has been moved into our room where it sat there for four hours. A third nurse eventually pulled it away to put back where it belonged. I looked at the C.O.W. and there was no signage about how to troubleshoot or who to call. I do not know if a nurse tried calling their helpdesk out of my view but it looked like nobody knew what to do with the broken computer. It seemed like nobody knew who was to take charge in fixing it. One can almost infer they expected it to magically fix itself! Three nurses spent time reacting to faulty equipment that could have been better used providing care to patients. Instead of spending their creativity solving patient issues, they use it creating workarounds. Lean thinking can help hospitals put systems into place to ensure equipment always works. Procedures can be created for what to do when something is broken and how to handle. Make things visual so staff doesn’t have to rely on memory or look up procedures because instructions are attached to the item being used. Helping remove waste and frustration from those giving care with make a better experience for those receiving care. While this picture is a piece of artwork it made me think what your organization can look like if you view Lean only as a set of tools. Losing the perspective of your system can easily lead to creation of complex and unusable solutions like this traffic light. When I look at this traffic light tree, I picture one team adding one of the lights, then another team comes along and adds a light for their use, then a management team adds a third light to summarize what the other two teams lights represent, then more teams continue to add their light for their own use, and so forth. While a new light may be a solution for each group individually, the net result is a confusing and unusable tool for the system. When you set out to improve things, think about the needs and impacts to the system. Take the time consider all options before acting. It is not true improvement if you optimize one area but the result is sub-optimizing another. We use Post Its a lot for teaching people how to improve processes and understand the current state. I thought this 1.5 minute video was fun and creative (RSS viewers will need to open post to view video). Thanks to the Visual Management Blog for alerting me about this video! This weekend I went out for fish and chips and saw this fantastic sign. The restaurant is very nicely helping their customers recognize the costs associated with taking excess inventoryof straws, tartar sauce, napkins, and other condiments. I am not sure how much savings they have seen since posting this sign, but as a customer I was more aware of how much I was taking (I happen to be a ketsup maniac). 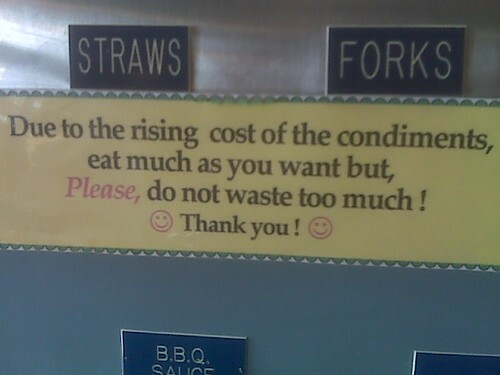 Do you think this is a good way to help lower waste or is a sign like this is too much to ask customers? Costs are out of control because the use of time, resources, and supplies are not always directly linked to money. I just worked on an improvement workshop where one of the targets was to reduce cost in after-clinic dictations. Until we discovered the rate per line associated with dictations, providers did not consider there was a meter running. I read Dan Ariely’s Predictably Irrational last year and never connected his chapter on stealing and cheating to how organizations easily spend out of control. The attached 19 minute video goes into deeper detail about his findings (RSS readers will need to open post to view). He found people would steal a coke from a fridge but not a dollar bill. He saw people cheat more if their reward was a token to be exchanged for money instead of the group who was given money directly. He asks if it is easier to steal a pencil or a dime from somebody’s desk. His findings were people steal or cheat more the farther away from actual money it seems. I honestly do not think staff is intentionally stealing but this concept can be applied to organizations. If there is not a direct connection between the use of something and the cost associated with it, then spending becomes rampant. Make costs visual, talk about them in meetings, show where you are saving money. In this tough economy, most staff would rather help save money than risk seeing them or their co-workers lose their job. I challenge you to reduce your meeting times by 50%. Can’t get everything done that you want to accomplish? We spend a lot of time in meetings but they are not always productive for every member in attendance. Reducing time in meetings frees you up for more time in Gemba where your time spent is more valuable. Look at meetings as the first place to remove overprocessing waste. Check out Reid Hastie from the New York Times article Meetings Are a Matter of Precious Time for more inspiration to make meetings more effective! Want To Know More About Visual Workplaces? Never settle for just letters and numbers to communicate. Mix words, numbers, shapes, and pictures to create more powerful communication. (I see the irony that this post has no visuals). I am currently reading Robert E. Horn’s “Visual Language: Global Communication for the 21st Century“. The book is an in-depth discussion of the semantics, linguistics, and structure of visual language. His site is located here. For those that want a more practical introduction, the outstanding book The Back Of The Napkin by Dan Roam is for you. This made me think of the power of gemba. Just looking at a report or process diagram will never replace what your mind sees when you go to gemba. Reading cycle & lead times on a chart will not show wastes like a worker searching for a tool. A spaghetti chart will not show stacks of papers in an inbox waiting as inventory. Gemba is a multi-sensory activity. Check out this airport sign. Sometimes visual systems get put up without thorough thinking and can cause even more waste! This SlideShare presentation from Johannes Bhakfi is fascinating. I love the use of visuals to communicate. RSS readers will need to open this post to be able to view the presentation. I have been writing a lot about the power of communicating with visuals. I am now looking to learn more about visual workplaces and visual management displays. I recently discovered Gwendolyn D. Galsworth, Ph.D from visualworkplace.com who was just in Seattle the week before I found out about her. I hope she comes back soon! It appears she has some great books and training products that I will be exploring soon. Mark Graban at leanblog.orgrecently interviewed her in a couple of 25 minute podcasts: Podcast #45 and Podcast #49. The interviews are very thought-provoking and stirs up my creative juices. Check out these podcasts if you would like to dip your toes into the waters of visual workplaces! This is a great presentation to give you an idea behind the basics of my current favorite book THE BACK OF THE NAPKINby Dan Roam. RSS readers will need to open this post to view. In case of squinting, you may need to view the presentation in full-screen mode.